Time is passing very quickly. That is why it’s essential at this juncture of our lives to stop and wonder deeply where we all have come from, for what and am I doing, and for what purpose I incarnated on earth. We took human form to experience our true nature (of peace, love, joy and freedom). However, most of us got so deeply involved in the material worldly drama and its temptations and attachments that we completely forgot who we are. Defilements of lust, anger, greed, attachment and pride/ego have taken their place in our lives over time. There is now an urgent inner call that we need to return to our intrinsic pure, kind and radiant heart nature. Knowing verily, the heart wherein has the least remnant of envy and ego, linger in the heart and one will attain full potential of peace, love, joy and awareness. The whole self-purification on a steady basis is geared towards this sublime aspiration. In ones deep knowing, it looks like everything including some calamities on a personal level and collective basis (i.e. now in Japan); is happening per Divine orchestration as the Divine Presence is there with every happening. Nothing can happen without Its Presence. Although it is difficult to recognize this Reality particularly in hard testing times, yet we have to realize it in the middle of all the happenings. The mind labels situations as good or bad as they appear on the surface, yet the Spirit (That we are) is above all this melodrama of life. That's why daily meditation, prayer and dispassion must continue to be our focus in the living of our lives. Whatever we are guided from within, let's do it and do it well in all situations. After doing the level best we must let it go for the sake of our own peace. So that we can continue moving further on a slow and steady basis. Granted we can fall in certain hard moments of life, yet we must arise. As this is where the greatest glory of human life is. 1. Acknowledge that this inner purification is very important. 2. Every negative thought and behavior creates negative energy, which we store in our intra cellular level, which blocks us to move to our Sat-Chit-Anand nature (i.e. Truth-Awareness-Joyfulness) and to know the SELF. 3. How can we stay in the energy of unconditional love, forgiveness and acceptance? 4. How can we purify the negative energy, which we have already accumulated? By doing selfless service and doing good actions. By being kind to others and compassionate in our behavior, or by sending unconditional love energy to those who have hurt you or whom you have hurt. 5. Keep on working to purify the thoughts with Self-unconditional love first and then to others. 6. Appreciating and practicing to pick up good/positive points from all the situations; good or bad, and being non-judgmental. - Consistently dwelling in Self that I am a pure loving peaceful soul. And in that mode I am one with the whole universe. Feel the deep connection with the Infinity. - Being non-judgmental and appreciating and practicing to pick up good and positive points from all the situations good and bad. - Sending unconditional loving vibrations without any judgments and expectations in return. That is what we are essentially in our nature. - Render selfless service according to one's own unique talents. - Expect nothing in actions and practice-detached involvement. - See the Divine Presence in all the situations, and that your presence becomes one with That Presence at all times, and in all situations. Situations are just situations. - Just do one’s best in all interactions as prompted by the Inner-Self. And letting it go (no expectations for this or that). - Practicing the Buddha's wisdom that attachment is the sole cause of all the miseries, and Awareness of ‘being unconditional’ sets a person free. - Thinking, speaking and envisioning only that what we deeply aspire to create. - Frequently making self-examinations as to how we are doing in all the above areas. 1. Activate your prana's energy by breathing deeply in and out from your diaphragm. Feel pranic energy to the fullest with your full attention towards it. And do this for a few minutes or until you start to feel relaxed, calm and peaceful. 2. Watch the flow of your breath from nostrils to navel on inhalation and navel back to nostrils on exhalation. 3. Feel that in essence I am a peaceful, loving and aware being and start to feel this energy from toes to top. 4. Breathe into the base of your spine and feel your own sacred energy invoking and rising towards the middle of your eyebrows at the Third Eye Chakra. 5. Meditate on this Chakra in silence for a few minutes and experience your true nature, your inner Spirit/Self, your true identity which is same as That of God. 6. Be there and experience deep peace, unconditional love, compassion, acceptance, forgiveness, non-judgment and kindness naturally flowing from your true nature. 7. Feel as a deep purification is happening in the level of your mind, in the egoic self as you meditate on the SELF within, your inner purifier. 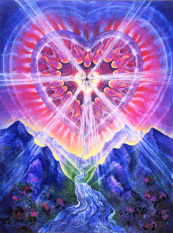 Affirm I am unconditional love, forgiveness and acceptance and let this energy flow towards every individual. 8. Stay there for as long as you want and experience your Sat-Chit-Anand nature and gently open your eyes when you are ready to come out of the meditation.